23 year old Sian Redgrave has won The Great Australian Bake Off 2015. 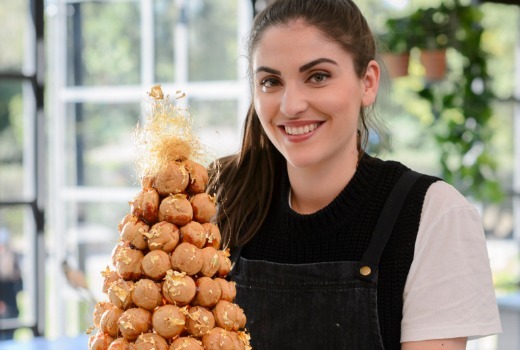 The fashion stylist from Perth impressed judges Maggie Beer and Matt Moran in the final Showstopper challenge with an extravagant Croquembouche perched on top of a chocolate mud cake. She beat Jasmin Hartley, 26 from Mackay, who whipped up a three-tiered wedding cake and Suzy Stefanidis, 45 from Melbourne, who created a gingerbread church. “It’s been an amazing experience and I feel so thrilled about winning. I hope that I keep doing my fellow contestants proud as they’ve all been wonderful people and I’ve learnt so much from them and the judges on this journey,” said Redgrave. She wins the title of Australia’s Best Amateur Baker, while her Italian Cheesecake Brownie recipe will be featured in delicious magazine’s March issue. The series, hosted by Claire Hooper and Mel Buttle, has become the highest ever-rating show on LifeStyle FOOD and applications are being accepted for a second Foxtel season. I adored this show. It felt natural and not overly staged and the contestants were all so lovely and supportive of one another. It was a copy of the British version, but it was done well, there was a bit of Aussie in there but it didn’t feel pushed or twee. It was a gentle show with no fireworks, dramatic music or hyped up and staged stunts. A pleasant change. As someone who records a lot of shows to watch later. Would be nice if websites like yours didn’t put spoilers in the headline. Planned to watch final this weekend and now I don’t need to bother. You did it last week too when you posted the pic of the final three on the main page. No I did not report Spoiler. I reported News sent via a press release from Foxtel themselves. The difference between aired / unaired has been outlined many times and is stated in the About page. Unaired = Spoiler. Aired = News. Agreed. But given Foxtel heavily promoted it’s IQ service you would think that people can be expected to watch shows later. While I agree it’s news, putting the result in the headline prevents me from making an informed decision as to whether I want to read the article. Your concept means a dedicated TV blog can never write “Julie Goodwin wins MasterChef” yet the rest of the media can, and social media can. It means every Reality win story becomes generic. It also means I can never put a winning photo on the front page. Nor key search terms for SEO in Google / Twitter hashtags. And then where do we draw the line? Why stop at reality wins? How does one decide which drama storyline is and isn’t headline-worthy? ie. death of Patrick in Offspring. Better to put a clear policy so you can adjust your use of social media accordingly. Constantly changing the line in the sand is the worst thing I could do. Trust me, this has been debated over 8 years (a radio station today asked me to debate Spoiler policy in the light of Star Wars). It is an ongoing argument. TVT policy is very clear, very simple. Aired = News. Thanks. Such a great season with genuinely lovely people who helped each other in challenges right to the end. So refreshing to see. I’m just disappointed they couldn’t give the winner something more than a cake plate and a recipe in a magazine for seven weeks of intense work. Memo to other commercial stations and their so called reality cooking shows ( MKR in particular): You don’t need the artificial drama, bitchiness between partners/other teams, exaggerated/staged crisis’s. This was, like its British version, a pleasant entertaining family friendly nights viewing.